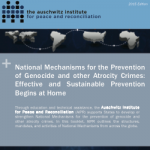 NEW YORK, NEW YORK – On June 9, 2015, AIPR launched the first edition of our National Mechanisms for the Prevention of Genocide and other Atrocity Crimes Booklet. 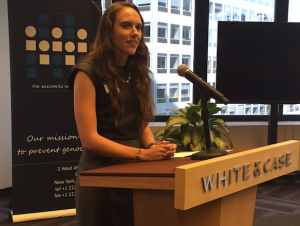 Hosted by White & Case, LLP, the event featured remarks by Davide Zaru, Political Officer, UN Office of the Special Advisers on the Prevention of Genocide and the Responsibility to Protect, Owen Pell, Partner, White & Case, LLP, Dr. James Waller, AIPR Academic Programs Director, and the booklet’s lead author, Samantha Capicotto, Directory of Policy and Planning at AIPR. National Mechanisms are officially established State bodies that include representatives from different areas of government relevant to the prevention of atrocity crimes. The formation of National Mechanisms represents a new trend in the prevention of mass atrocities among States. They aim to develop a unified national policy platform towards prevention and to operationalize preventive action within government. The booklet highlights a cross section of States that have officially established their Mechanisms, as well as States where Mechanisms are in initial stages of development. Based upon interviews with members of nine National Mechanisms from Africa, North America, and Latin America, the booklet explores the history, mandates, structure and outputs, if any, of these critical inter-departmental and/or inter-ministerial bodies devoted to prevention. A few of the mechanisms you’ll see featured in this booklet are new, they are emerging, so they do not necessarily have outputs yet. But others are quite far along, for example, the Tanzanian National Committee has already engaged in holding peace forums on behalf of religious leaders in the northern region of the country where tensions remain a concern. 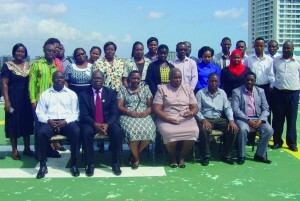 To read more about the strides Tanzania has taken towards prevention via their National Mechanism—and for information about the other mechanisms featured in the booklet, including those from Argentina, the Central African Republic, the Democratic Republic of the Congo, Kenya, Mexico, Paraguay, Uganda, and the United States—please click here to view the booklet. And to connect with representatives from the National Mechanisms featured, please contact Samantha Capicotto.